Every time I start an organization project, D just sort of rolls his eyes and waits because he knows it will eventually fail. That's why one of my big goals this year is to get organized. Really organized. Some aspects of our lives do run very well. Mainly meal planning. That's a trait I inherited from my mom and I think stems from my love of saving money. I used to blame my lack of organizational skills on a lack of space. The old house was small. Eight people in 900 square feet. There weren't enough places to put people let alone things. I don't have that excuse now. Well, not exactly. Even though this house is almost three times the size of the old one, I still lack space...storage space to be exact. We are trying to make space. For Christmas, D knocked out a false wall and put in some shelving. It's very unfinished right now, but I have some shelves to store kitchen items...under the stairs in...well, one of the many spaces in the house that lack a proper name. We call it the Harry Potter room. It's sort of a hallway that goes under the stairs that has two closets. My kitchen lacks storage. I have four drawers and a row of cabinets and about three feet of counter space. When we looked at the house, all I saw was potential. I didn't think about the functionality of it while we saved up the money for a remodel. It is very much like the kitchen in the old house...before we remodeled. The good news: I know what could make it work. Storing the big stuff wasn't much of a problem. It was the cooking utensils, measuring cups, cutting boards...those types of things quickly became an unorganized heap in the drawers. In the old house I stored many of those things in baskets. We had deep drawers. Not so much in the new house. The only basket that fit was the one for my measuring cups. Then, inspiration hit. Or rather, inspiration crashed in to me completely by accident. Leelee had made quite the mess while cooking and some of it ended up in the bottom drawer. I needed to pull everything out of the drawer and I didn't want to just heap it on the counter. And that's when I saw the empty box from the 12 pack of Mt. Dew. I pulled off the top and dropped in several spoons and spatulas. I'm sorry to share this before the boxes are all prettied up. I'm a function over form kinda gal. No one is going to see in that bottom drawer outside of the family. And, I love my readers, but I'm not dragging out the paint for you on something like this. Or the decoupage. If you want to do this project, go for it. Make it purty. Me? 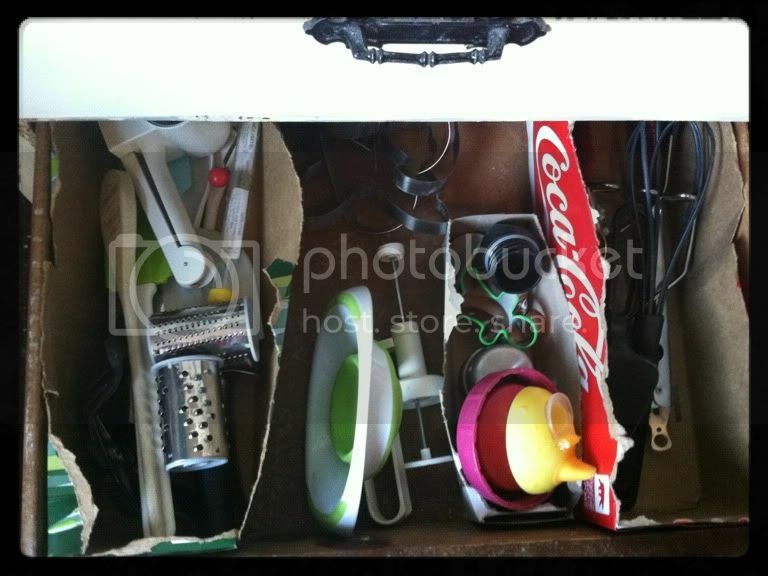 I'm thrilled with the idea of ripping off some cardboard and sticking it in a drawer and calling it organized.